Museums for Hands at Home | Love Those "Hands at Home"
A lot of things make me feel warm and tingly. You already know about many of them. Handmade makes me warm and tingly. Anything to do with words gets me pretty excited. I love history and tradition and human symbolic behavior. Another thing that makes me feel all warm and tingly is Magna Carta. That’s right. An 800-year-old document gets me excited and when that document gets incorporated into a modern artwork, a huge piece, hand embroidered by hundreds of hands, working cooperatively? Well! Tingle, tingle! Magna Carta is 800 years old this year and that has gotten lots of people thinking and talking about what it has meant, to England, to the United States, to democracy and justice. Magna Carta may mean something different to each individual. I like what it meant to my American forebears, how it influenced the Revolution, and our Bill of Rights. I like that it seems to have led us toward equal justice under the law. To me, it means that no one is above the law—too important to be bothered by the rules that bind the rest of us—or beneath the law—too unimportant to warrant protection from unfair bias and arbitrary persecution. So, how about this embroidery? My pal Gallivanta steered me toward a story that blew me away. You can read about it in detail elsewhere; think of this little post as a “heads up” to go look at the links I’ll include at throughout! Magna Carta (An Embroidery), undertaken by British artist Cornelia Parker, has it all. The work was commissioned by the Ruskin School of Art at the University of Oxford, along with the British Library, after having been chosen from a group of proposals. This project moves me in so many ways! Parker combines the gravitas of history and tradition with a 21st century flair. 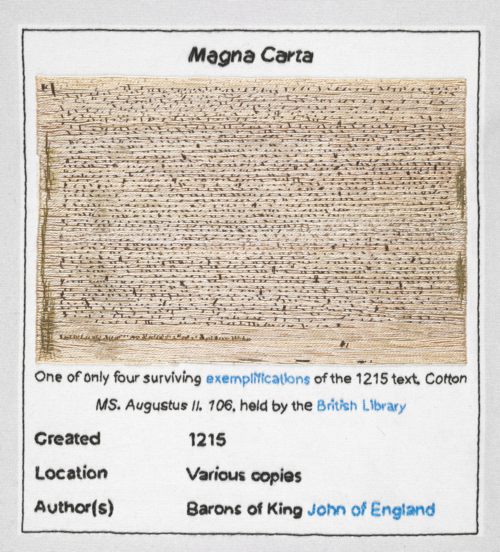 The meaning and value of Magna Carta has been constantly re-interpreted and re-negotiated over the years so it seems especially appropriate that Parker chose to make her text a screenshot, taken on June 15, 2014, of the Wikipedia entry for Magna Carta. Because Wikipedia is crowd-sourced and constantly amended by people like you and me, the articles constantly re-negotiated in a largely democratic way, it reflects not official truth but a communal representation of what Magna Carta meant on its 799th anniversary. It seems fitting that an historical document so often adapted to the needs of different people and times is offered to us in a format that is constantly open to our adaptations as well. Parker also made a conscious choice to take the digitized word and transform it by hand crafting. When the words and images of Wikipedia are translated into embroidery, they are elevated in ways that ask us to re-see and re-think words that may have lost depth of meaning. The stitchers certainly had plenty of time to consider the words they worked on, sometimes as few as one or two. As viewers, we ponder the stitches, as individual as the stitchers who made them, and see the words, as if for the first time. And consistent with Magna Carta’s principles of justice, fairness, and equality under the law, the embroidery work was done by a large group of stitchers, a group as varied as the peoples Magna Carta has been held up to protect and represent. Parker drew her stitchers from many sources and walks of life, from peer to prisoner, choosing people who represented groups, like convicts and barristers, that have been associated with Magna Carta. Over 200 stitchers contributed and the majority of the text was done by prisoners from the social program Fine Cell Work (which deserves a blog post of its own!) The Wikipedia images were re-created by members of the Embroiderers’ Guild, from across the UK. Some of the stitching is expert and exquisite, some is rough and labored. The fabric holds stains, from tea and blood. It is not even and pristine and perfect, any more than is history itself. The project seems to me to take the iconic and make it real again, to take the digitized and modern and make it warm and human. The varied stitches in the piece remind us that real people held the needles and that real people both shaped these words originally and are affected by them every day. It reminds that a word such as “freedom” will look, and mean, differently depending on who is uttering or crafting the word. I hope you’ll go look for yourself. I have no access to photos other than those I can poach from the internet and I don’t like to do that (too much!) You can see many images typing the words “magna carta an embroidery images” into your search engine. But, really, the best place to see and hear the story is in the video shared by Gallivanta. I predict it’ll make you feel warm and tingly too! 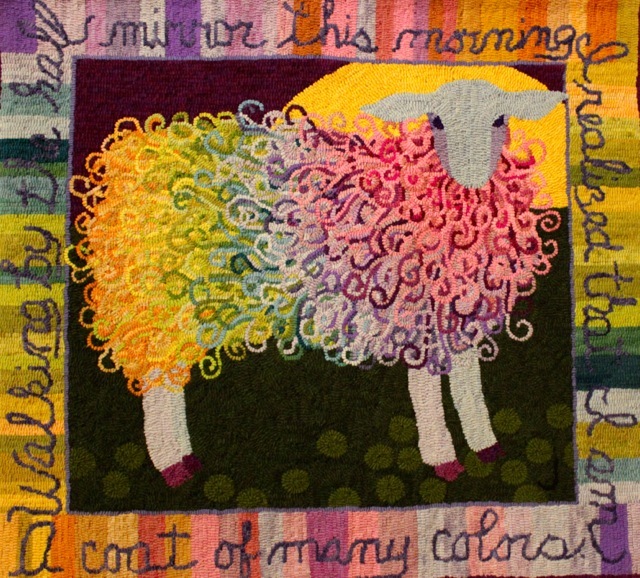 It’s been a great year for viewing exceptional old quilts made by Amish and Mennonite quilters! I’ve written elsewhere about antique quilt displays and about Shelburne Museum, but I haven’t put the two together and written about the antique quilt display currently hanging at Shelburne. 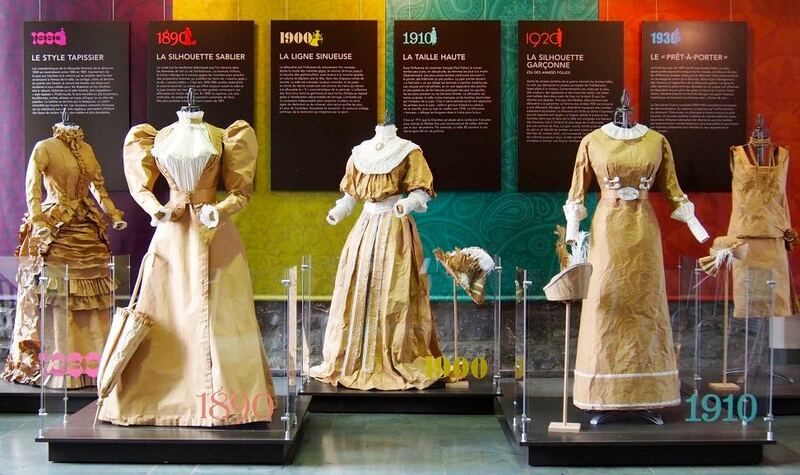 The Shelburne Museum, in Vermont, is known for its terrific focus on folk arts and for its collection of over 500 American quilts. This summer one of the special shows has been All Star Quilts. 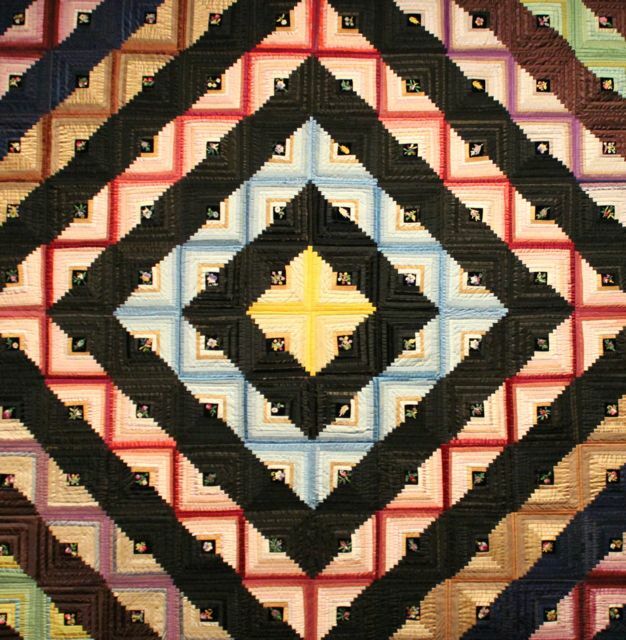 These quilts are all from the 19th– and early 20th-centuries, mostly made by Amish and Mennonite women, made of solid color fabrics, and all made with patterns based on stars. 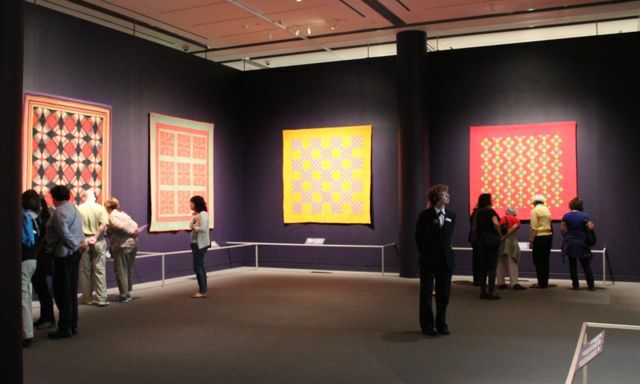 The quilts come from the collection of John Wilmerding. Wilmerding is best known as a preeminent art historian, collector of American fine art, and curator. But his grandmother was Electra Havemayer Webb, an avid collector of folk art and the founder of Shelburne Museum. 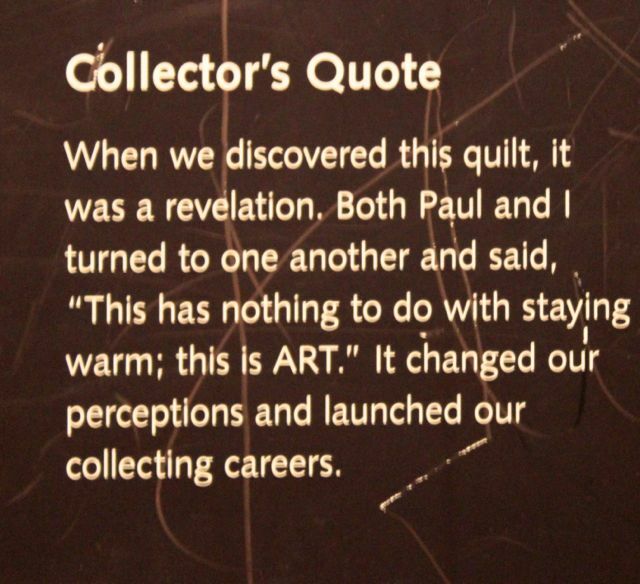 Wilmerding came honestly by his appreciation of folk art quilts! 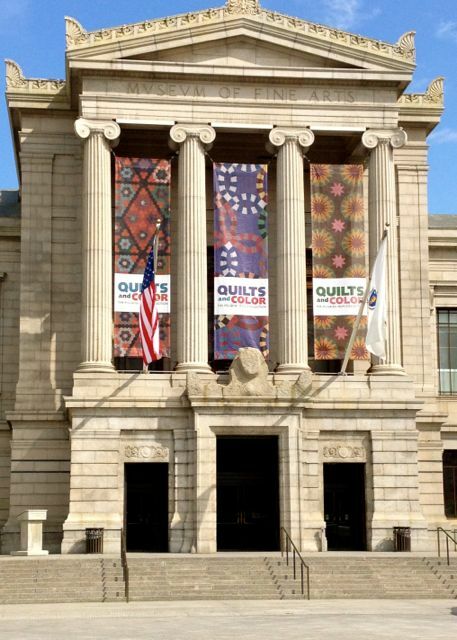 As was the case with the antique quilt show at the Museum of Fine Arts in Boston, many of these quilts were displayed against black walls, which made the quilts appear to just glow with color! 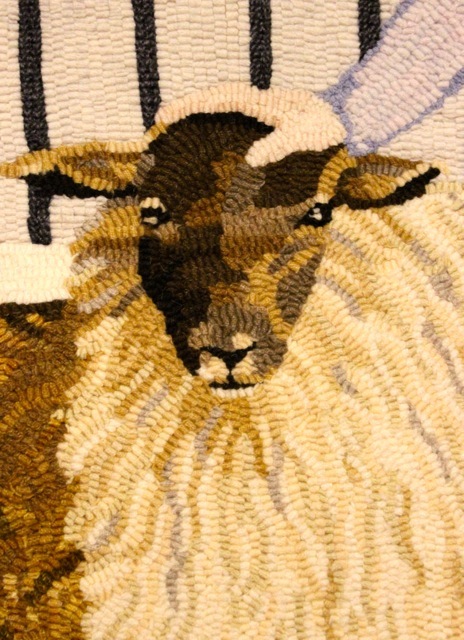 Just about a year ago, when I started my blog, I wrote about an exhibit of hooked rugs I had seen at Shelburne Museum, in Vermont. These rugs, made by Patty Yoder, are so beautiful and so successfully bring an new artistic vision to an old craft form that I was excited to share them. The problem was, I had just started my blog and almost no one was reading it yet! So the delightful, sweet, hand-hooked sheep were enjoyed by only about 4 people. We went back to Shelburne last week, and visited the sheep again–they are still splendid. I took some new photos and am refreshing what I wrote, with hope that you’ll find them as compelling as I do. The exhibition features about 20 of the 44 hooked rugs Yoder made in the 13 years between her retirement and her death in 2005. That’s a very short time to develop skill and a personal vision but these rugs are amazing in both ways. 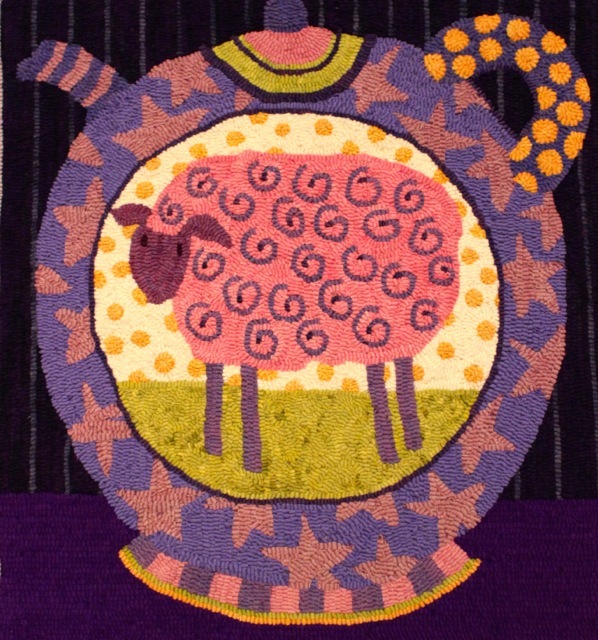 Have you ever tried rug hooking? I have. It was hard! All those strips of wool sitting around, flat and uninteresting, and the maker needs to be able to envision how those pieces fit together, how to vary color, how to bring them through the backing fabric in a consistent manner. Yikes. My failed attempts at rug hooking made me much more appreciative of what Yoder accomplished with her work! The Patty Yoder show is up through October 31, 2014. I know most of you will never be able to see these in person but I hope the photos give you a sense of how loving hands can transform strips of fabric into a whimsical farmyard of sheer delight!